1841 Census: William Allan, clerk, with 4 boy pupils and 3 adult sisters of independent means. The school must have been in part of Mount Ararat House. 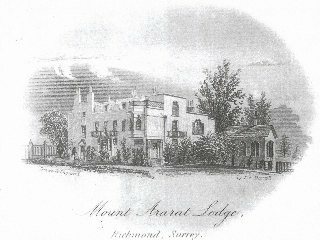 Mount Ararat Lodge, Richmond, Surrey. It is but a letterhead steel engraving of my old school-house, where I was sent at an early age to acquire so much knowledge as that worthy pedagogue, the Rev. W. Allan knew how, or cared, to impart. The Rev. W. Allan was one of three sons of an Aberdeen Episcopalian clergyman. He was a worthy, moderately intelligent man, of the then prevalent school of theology; narrow-minded, violently prejudiced, kind-hearted and at the time I was under his charge quite as inefficient an instructor of youth as ever lived. He pretended to teach Latin, Greek, Arithmetic, French and Drawing. Of the four first I believe he knew something, but was too indolent, or too incapable of teaching, to impart any portion of it ti me, for i do not think I was too stupid to learn if I had been taught with moderate intelligence; but at the end of two and a half years (I went to him when twelve years old, and I left school when I was fourteen and a half) I had gained from him about as much learning as Pip acquired from Mr. Wopsles's great aunt. How many feelings this little print recalls to may mind I cannot describe, for it would make a book in itself. The house was an old-fashioned, comfortable dwelling, but the miserable little building on the right was worthy old Allan's great pride; it was a wretched sham-gothic schoolroom, built, I believe, with a special view to keeping the boys in a freezing condition during the winter. The last time i saw the place it was in a miserably degraded condition, and it is probably pulled down to make room for a row of sordid-looking tenements. 1851 Census: Harriet Price, Governess, her young sister, 13 girl pupils, a French teacher and a servant. 1861 Census: Herbert Williams, his wife and 2 daughters, 19 boy pupils, a French teacher, an English teacher, and 2 servants. 1871 Census: no mention of a school here though there was one now at Hope House.